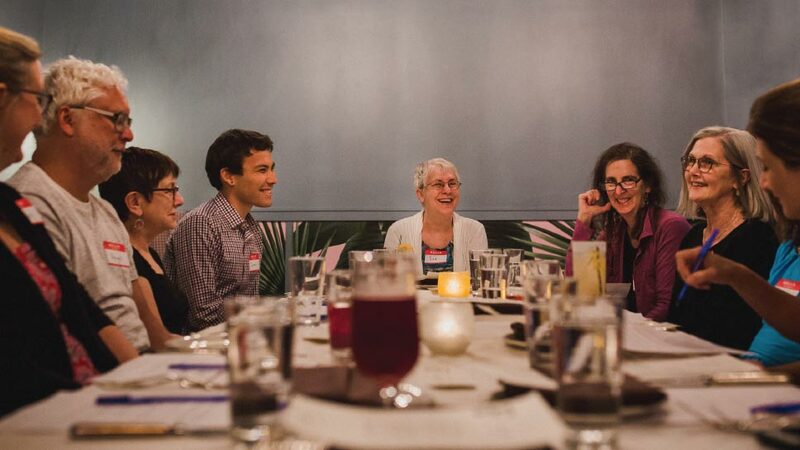 That was a decade ago and Across The Table recently completed its 73rd dinner—right here in Evanston at Found—a testament to the power of conversation to break down boundaries and broaden understanding. The organization’s mission has never been more necessary. With several more topic-focused dinners coming up in Evanston this fall, we were intrigued to find out more. What inspired you to found Across the Table? I moved to Chicago in January of 2000 and taught high school English in the city at Kelvyn Park High School. My background was different from my students’ but despite this difference, we connected very deeply. My students and I had profoundly honest conversations around many issues that touched all our lives, including issues of race, gender, socio-economics, and privilege. I wanted to give adults from all walks of life the opportunity to connect through these same kinds of honest, important conversations. As I reflected on this goal, I knew that in order to have this dialogue, the conversations needed to be facilitated and focused around a topic that would highlight our shared, human experience. Conversations might focus on the meaning of freedom, the definition of a home, or the essence of being good. With these ideas in mind, when I launched Across the Table, I was very intentional about how I chose to structure the dinners. The format, with no more than 10-12 people, a facilitator, and focusing on a universal, human experience theme that is accessible to anyone, regardless of level of education or knowledge of current events, has enabled Across the Table to remain true to my initial goal in founding it. Your most recent dinner was at Found. What was the topic and how many people attended? The topic at Found was “How does our social class impact our identity?” As always, 12 people were in attendance. What is the significance of breaking bread to open communication and break down boundaries? Breaking bread is fundamental to community, and it is an important component of communication in every family and in every culture and ethnic group. Breaking bread automatically creates a natural commonality among our participants, giving them a comfortable platform for our conversations. Sharing food automatically connects people and gives our participants a shared experience. Eating while having our intentionally challenging conversations brings the gathering into a more welcoming, nurturing and informal realm. Eating is something we all do and by engaging in an activity that is enjoyable for everyone and significant across all cultures, we are brought together and we are engaging in something fun, even when the dialogue pushes our own boundaries. Of all the events your organization has hosted do you have any meaningful or particularly poignant moments? There, of course, have been so many, but I am constantly impressed by how our diners kindly and enjoyably disagree with one another. At every dinner, there are people with divergent points of view and experiences. At the same time, even though people may have differing opinions on the issue at hand, they often discover shared commonalities as well. Simultaneously, I am constantly amazed by how quickly people trust the other participants and how they are willing to share stories about their distant or recent past and how they are willing to share accounts that in other situations may be too personal, too much information or off limits. Of course, we don’t expect this and don’t require this, but when people do take that risk, the conversation can go to an even deeper more impactful level. DATE: Wednesday, September 5, 6 p.m. DATE: Monday, September 17, 6:30 p.m. DATE: Wednesday, October 17, 6 p.m. DATE: Saturday, November 3, 5:30 p.m.
TOPIC: Across the Table’s annual fundraiser, “Evanston’s Largest Conversation,” which is supported by Farmhouse Evanston and Few Distillery. This will be a larger scale dinner with many topics to choose from, multiple facilitators, complimentary cocktails, and a four-course dinner to enjoy. I have enjoyed attending Across the Table and look forward to future dinners! It is wonderful way to meet new people all who gather for fun, meaningful conversation and great food ! Thanks Lauren for bringing Across the Table to Evanston !